I am a runner and wanted to create a fun costume with my $10.00 budget for a local Halloween Costume 5K. I went to one of my favorite thrift stores and found a cute white dress for $2.50... Right then and there my idea for my runaway bride costume was born. Next, I checked the Halloween costume section of the store and found the bridal veil in the kids costume box for a mere $.75. Next stop the Dollar Store for fall flowers and leaves to accessorize my bridal veil headband with and for my bridal bouquet, total spent $5.40. Total cost of my second place winning Halloween 5K runaway bride costume $8.65. This photograph was taken of me in my runaway bride costume in Port Gamble, Washington by my friend on a beautiful dry fall afternoon. 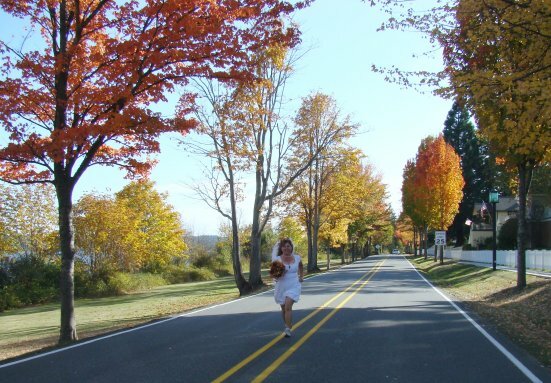 My friend encouraged me to take this humorous runaway bride photograph.